Charge your USB 2.0 USB-C devices, such as your MacBook or Chromebook, from a USB-C AC wall charger. This USB-C™ to USB-C cable lets you charge and sync your USB Type-C™ devices. It's also compatible with Thunderbolt™ 3 ports. Connect your newer USB-C mobile devices, such as the Samsung Galaxy S8, S8+, Nexus™ 6P, and 5X phones, to your computer. The cable delivers up to a 3 amp charge, and supports data transfer speeds of up to 480Mbps. With up to 3A of power output, this USB Type-C cable can also be used to power a USB-C laptop, such as your Apple MacBook or Chromebook Pixel™. Simply connect your laptop to your USB-C wall charger. Replace the cable that came with your device, or keep one as a spare while you're traveling, so that all of your devices will be ready to use whenever you need them while you're on the road. 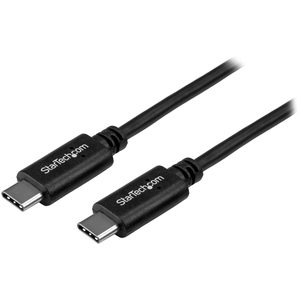 This USB-C cable has been certified with USB-IF (USB Implementers Forum) in order to meet all USB 2.0 specifications. This includes all environmental, electrical and mechanical standards set by USB compliance. 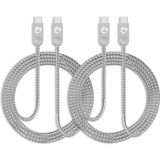 This ensures a high-quality, reliable cable for all your USB-C devices. 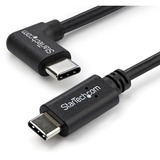 The USB2CC1M from StarTech.com is backed by a lifetime warranty for guaranteed reliability.